Welcome to the Summer Character Sleep Pant Wardrobe Giveaway Event! With the summer heat in full force, we thought you could use some cool new PJ pants! These character sleep capri pants from Richard Leeds International are made of soft, 100% cotton to help keep you cool all summer long, and are available in Mickey, Minnie, Ariel, Minions, Dory, Eeyore, Hello Kitty, TMNT, Batman, Wonder Woman, and more. Holly from Southern Mom Loves reviewed these new sleep pants (available at Walmart.) You can see her full review here, and then enter to win a full summer sleep pants wardrobe below! 1st Prize: 1 (One) winner will receive one of each sleep pant design for a total of 11 pairs of sleep pants! 2nd Prize: 2 (Two) winners will each receive 5 pairs of sleep pants! 3rd Prize: 5 (Five) winners will each receive 3 pairs of sleep pants! 4th Prize: 16 (Sixteen) winners will each receive 1 pair of sleep pants! 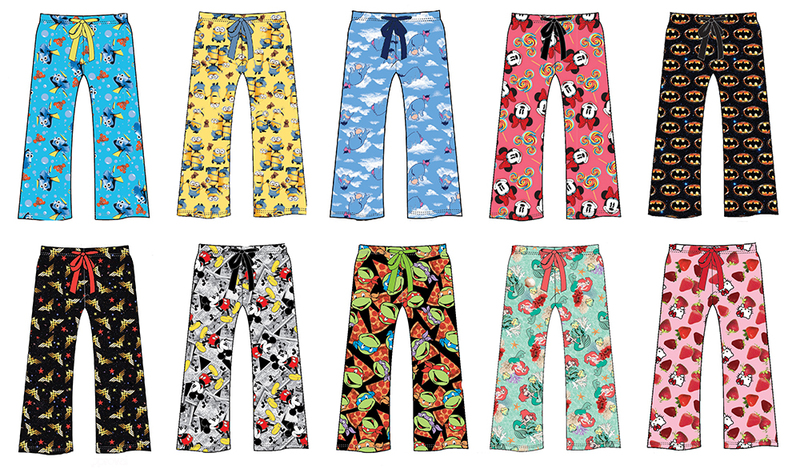 24 total winners will be sent fun Character Sleep Pants in randomly chosen designs from the styles shown above, in their Women's size as they state it in the Giveaway Tools widget below. (ARV $518!) Enter below, the odds are fantastic! Giveaway begins on 7/8/16 at 1:00 am CST and ends on 7/29/16 at 11:59 pm CST. Must be 18 years or older, open to residents of the US only. Once confirmed, the winners will be added to the Southern Mom Loves Winner's List. Disclaimer: The participating bloggers were not compensated for this post. No purchase is necessary to enter. One entrant per household, per address. All entries will be verified. Void where prohibited by law. Winner will be contacted by email; Please add southernmomloves@gmail.com to your whitelist. Richard Leeds International will be responsible for prize delivery to the winner. This giveaway is in no way administered, sponsored, endorsed by, or associated with Facebook and/or Twitter, Google, Pinterest, or any other social media platform.